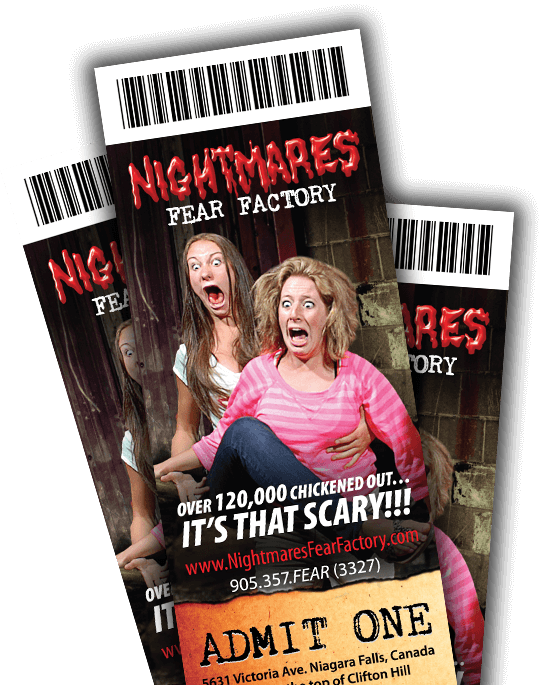 Nightmares Fear Factory is committed to protecting your personal information, and complies with all applicable Canadian privacy laws. We may collect and store any Personal Information you enter on the Website or provide to us in some other manner. When you enter our haunted house facility, we may photograph, record or video you while you are within our exhibits. When associated with you, this information is Personal Information. If you choose to register with the Website by signing up to receive emails from us, you must provide us with your name and email address. If you wish to contact us with an enquiry via our Website, we will request certain information from you, including your name, complete contact information, email address, and information regarding the products or services that you have purchased or wish to purchase or which you have a query or comment about. If you contact us directly regarding purchases, customer service, warranties, claims, returns or any other similar matter, we will gather Personal Information directly from you relating to that matter. In addition to the Personal Information submitted to us, we may collect information about you automatically when you connect to the Website using cookies or other web technologies (“Website Use Information”). A cookie is a small file containing a string of characters that is sent to your computer when you visit our Website. When you visit the Website again, the cookie allows that site to recognize your browser. Cookies may store unique identifiers, user preferences and other information regarding your use of our Website. The information we collect includes general information about your computer settings, your connection to the internet, your browsing patterns and your geographical location. Most internet browsers give you the option to reject all cookies, accept all cookies, erase cookies stored on your computer or be notified before a cookie is stored on your computer. However, if you reject or erase cookies some of our Website features, features or services may not function properly or be fully available. You will need to refer to your internet browser instructions to find out more about these options and how to use them. Set your browser to decline third party cookies. - Delete the advertiser’s cookie each time you get it. Any Personal Information you provide will only be used or disclosed for certain purposes as described below. Display on our Website: We display pictures, recordings or videos of our patrons on our website and on related third party social media websites. By entering our facility, you consent to the use of such information on our website, provided that it is not associated with your name, address or any other information that personally identifies you to third parties. We do not consider this information to be Personal Information when it is not identified with you; however, we will honour any request to remove a picture, recording or video from our website and any related third party website page under our control as soon as commercially reasonable upon receiving such a request. Correspondence: We generally monitor and/or keep records of all of our e-mail communications and other correspondence. If you send us correspondence that contains Personal Information, we will use that Personal Information to address the nature and purpose of the correspondence. Customer Service and Complaints: We may use your Personal Information if required and to the extent necessary to provide you with customer service, and to address any complaints you may have. Warranties and Returns: If applicable, we may use your Personal Information to the extent necessary to process any warranty claims, returns of defective products, or other similar claims made by you with respect to our products or services. Newsletters and Promotions: If you opt-in to receive information from us about goods and services that may be of interest to you, we may contact you by email with information about us and third parties we have selected regarding goods and services, articles, newsletters and special or promotional offers (including sweepstakes and contests) provided by us or these third parties. We may use other Personal Information that you have provided to us to assess which products or services may be of particular interest to you. If, at any time, you decide that you no longer want to receive such email communications, you may opt out of receiving them by clicking the “Unsubscribe” link at the bottom of the email received or contact the privacy officer below to unsubscribe from future emails. Please note that it may take up to 10 days to complete the process of removing your details from the mailing list. Marketing and Market Research: We may contact you by email for marketing and market research purposes. We may use the Personal Information gathered from these marketing efforts to assess how we can improve our products and services, and how we can more effectively market those products and services to you and other customers like you. Website Use Information: We may use the information obtained from Website Use Information to improve the quality of our service, including for storing user preferences, tracking user trends and providing relevant advertising to you when you are on our Website. Social Networking Information: If you connect to our site using a third party social networking site such as Facebook or Twitter, we may use that information for the marketing purposes described above, and to promote our goods and services to you in the future through those sites. With Third Parties of Potential Interest to You: If you expressly consent, we may provide your Personal Information to third parties so that they may share with you information relating to their goods and services, contests and sweepstakes. That is the only use they are contractually authorised to make of your Personal Information, unless you provide additional consent. You can withdraw your consent at any time. In connection with business transfers: If any business forming all or part of the business of Nightmares Fear Factory, shall be bought, sold or otherwise transferred, Personal Information may be transferred along with the other transferred assets. We keep your Personal Information only as long as is necessary for us to achieve the purpose for which it was collected, and promptly and securely destroy it after that time. The methods that we use to destroy your information will depend on the sensitivity of that information, but in any event we will use at least industry standard practices to destroy it. You can ask us to review the Personal Information we hold, and ask us to change or delete any of this information. We may require that an individual provide certain information before we process the request, for verification purposes. You can do this or ask us any other questions or share your concerns by contacting our Privacy Officer at [email protected] or by writing to Nightmares Fear Factory, 5631 Victoria Ave., Niagara Falls, Ontario, Canada, L2G 3L5. Read more about Things to Do on Christmas in Niagara Falls! Things to Do on Christmas in Niagara Falls!